This collection of over 150 unmissable beer experiences features the world’s greatest beers, bars, breweries, and events: it’s the ultimate bucket list for every beer lover. Combining travel, city guides, food, and history, The Beer Bucket List takes you around the globe, via traditional old British pubs, quirky Belgian bars, brilliant Bavarian brauhauses, spots to enjoy delicious food and beer, the hop gardens of New Zealand, Southeast Asia’s buzzing streets, amazing beer festivals, unique beer styles, pioneering breweries, and the best new craft brewers. 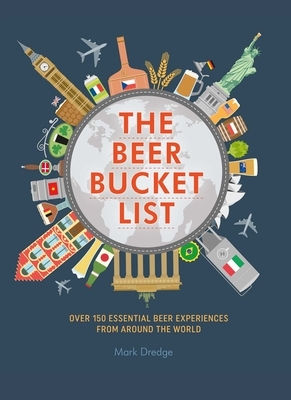 This is any beer lover’s must-read book about the most essential beer experiences on the planet. Mark Dredge is an award-winning beer, food, and travel writer from London, England. In 2011, 2013, and 2014, he was awarded Beer and Food Writer of the Year from the British Guild of Beer Writers for the work on his blog Pencil and Spoon and then his first two books, Craft Beer World and Beer and Food, which also won an award from the North American Guild of Beer Writers. In the last year Mark wrote The Best Beer In The World and Cooking with Beer for Dog 'n' Bone, and his writing has featured in leading publications across the globe; he’s also an international beer judge. You can follow him on Twitter and Instagram: @MarkDredge.